Home › Bibliography › Silent Witness: Violence and Representation. Silent Witness: Violence and Representation. pros* Issue One stages a series of conversations that center around Ken Gonzales-Day’s photographic series, California Hang Trees and Erased Lynchings, in an effort to continue a dialogue around racial violence, history, representation, and UCSD’s own participation in remembering and forgetting such trauma. The dialogue begins with an interview between Ken Gonzales-Day and the exhibition’s curatorial team: Grant Kester, Elize Mazadiego and Jenn Moreno and then extends out to a number of diverse voices in the form of text and image. 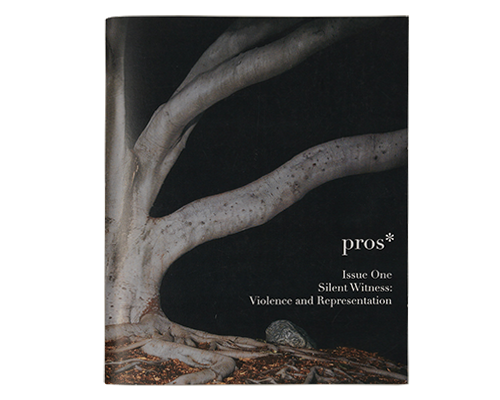 pros* Issue One features contributions from: Shane Anderson, Crystal Campbell, Tania Jabour, Diana McClure, Omar Pimienta and Steve Ruiz. ‹ Silent Witness: Recent work by Ken Gonzales-Day.